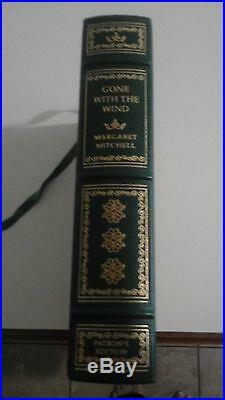 THE PATRON'S EDITION OF GONE WITH THE WIND (MS). This edition was printed in 1986. The book was only offered by private invitation from The Franklin Mint to "GONE WITH THE WIND" collectors and has long since been out of print and very rare to find one in unread condition. This book is heavy, weighing 3 3/4lbs. It is bound green leather and 22-karat gold lettering with elaborately decorated 22-karat gilt boards. Four raised bands on spine. All edges and corners are 22-karat gold gilt. The acid-free paper used in this book conforms with the guidelines for performance and durability set by the Council of Library Resources and the American National Standards Institute. The book comes with a Certificate of Authanticity (COA). The book comes in a slip in case. The illustrations were created exclusively for this edition by Edward Martinez. BOOK WITH SLEEVE (SLIP IN CASE). PLEASE NOTE THAT THIS ITEM WILL ONLY BE SENT ON MONDAYS AND TUESDAYS. LOOK AT MY STORE FOR OTHER GREAT DEALS. The item "GONE WITH THE WIND PATRON'S EDITION EXCELLENT CONDITION 22 KARAT GOLD WithCOA" is in sale since Wednesday, February 21, 2018. This item is in the category "Books\Antiquarian & Collectible". The seller is "cynthiaemery" and is located in Canton, Michigan.